212 pages | 28 B/W Illus. 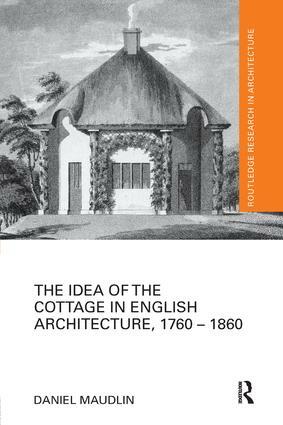 The Idea of the Cottage in English Architecture is a history of the late Georgian phenomenon of the architect-designed cottage and the architectural discourse that articulated it. It is a study of small buildings built on country estates, and not so small buildings built in picturesque rural settings, resort towns and suburban developments. At the heart of the English idea of the cottage is the Classical notion of retreat from the city to the countryside. This idea was adopted and adapted by the Augustan-infused culture of eighteenth-century England where it gained popularity with writers, artists, architects and their wealthy patrons who from the later eighteenth century commissioned retreats, gate-lodges, estate workers' housing and seaside villas designed to 'appear as cottages'. The enthusiasm for cottages within polite society did not last. By the mid-nineteenth century, cottage-related building and book publishing had slowed and the idea of the cottage itself was eventually lost beneath the Tudor barge-boards and decorative chimneystacks of the Historic Revival. And yet while both designer and consumer have changed over time, the idea of the cottage as the ideal rural retreat continues to resonate through English architecture and English culture. Daniel Maudlin is Professor of Early Modern History at the University of Plymouth. He has previously held positions at Plymouth School of Architecture, Design and Environment, Dalhousie University, the University of Pennsylvania and the University of Glasgow. From farmhouses in Nova Scotia to aristocratic retreats on English country estates, his work focuses on the social meanings of design and the consumption of domestic architecture in the early modern British Atlantic world. He also writes on architectural theory, modern vernaculars and the everyday.